You are an advanced ESL student ready to transition to GED classes. Now is your chance to show yourself that you are ready for the next level. You are going to be thinking about Abraham Lincoln. Lincoln is a historical figure known for his leadership. Imagine what President Lincoln would have accomplished if he had not been assassinated. In this project you will practice research skills, plotting information on a timeline, and using this information to imagine and describe an accomplishment of Abraham Lincoln as President of the United States if he had not died. 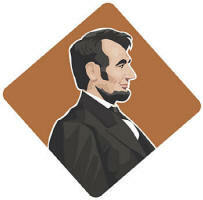 First you will begin by researching the accomplishments of Abraham Lincoln. Take notes of his accomplishments. Here are a few links. Feel free to find other links. Next you will research how many years President Lincoln could have stayed in office. Be thinking about how many more years President Lincoln might have been in office. You will create a timeline of Lincoln’s life including the additional accomplishment that you are going to add to his life story. Plot the accomplishments of Lincoln on a timeline. Using what you know about Lincoln’s life, you will imagine and create one more accomplishment that you believe he would have accomplished and add it to the timeline. The Process section has links for you to explore. Feel free to find more links. Make a note of mentors or supporters that you sought out for help—a friend, a child, a volunteer. 2 or less points are noted. 5 or more points are noted. Timeline is chronological, accurate and neatly presented with even spacing to reflect passage of time. Timing of imagined event is realistic within presidential term limits. Imagined event shows understanding of term limits and Lincoln’s life (has to do with slavery, civil war, etc.). Imagined event shows understanding of term limits and Lincoln’s life and is supported with a reference to research. When you finish this project, you will have researched the life of Abraham Lincoln, used that information to imagine what Lincoln might have accomplished and then plotted the information on a timeline. You will have thought about whom your resources are and you will remember to use them as you take your GED classes. Learn to ask for help as you start a higher level of classes. Congratulations! You can do it! Since this is introducing high level ESL students to a next level of learning, it is okay to do some hand-holding and guiding. Feel free to give students tips on how to research and how to document that research. You might encourage them to put one point each on a note card, etc. Any guidance on how to search and record information. Also, if using Excel or Word, consider making the plotting of a timeline a class project having the student bring their research and then teaching them how to use Excel to present the information. Use your discretion based on your students’ skill levels.